Modern 2 1/2-inch and 3-inch .410s with an old 3-inch paper-hull shell shown between the plastic loads. Although commonly called “a gauge,” the .410 shotshell in either 2 1/2-inch or 3-inch chamberings is more properly “a bore” as the number refers to bore diameter in tenths of inches. Yes, the .410 is very useful on close-flushing game (like stomping up rabbits in young pines) and on easy-to-disable game in cold weather. I also like it for squirrel hunting in wet weather when they are feeding on the ground and offer close-range shots. 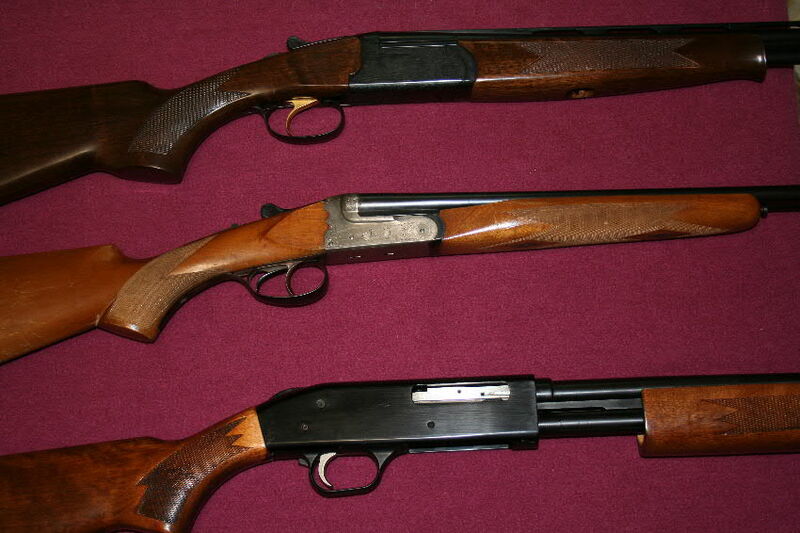 A Italian Vernona over/under double (top), a Spanish Stoeger Zephyr side-by-side from the 1970s and a modern Mossberg 500 pump (bottom). The .410 is chambered in single shots, combination guns (Savage 42 which is typically 22 L.R. or .22 Rimfire Magnum/.410), double guns and even in revolvers as a close-range self-defense round loaded with both slugs and shot. 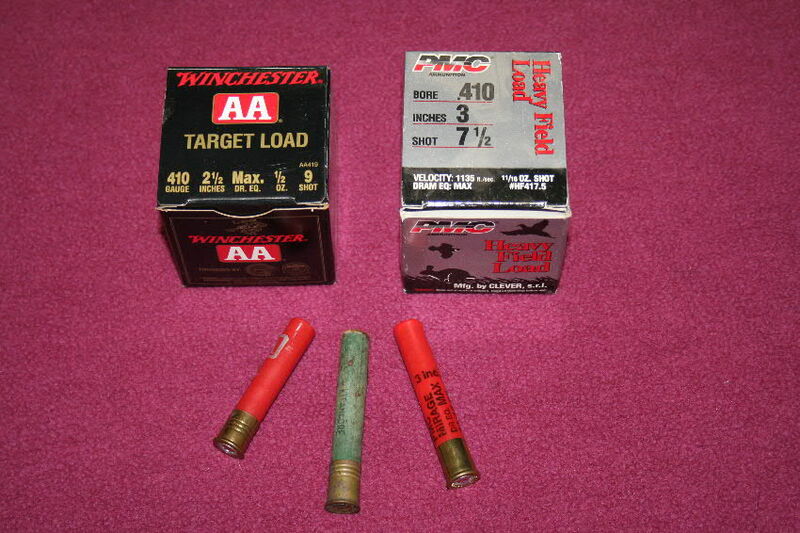 Typically .410s are tightly choked and their performance is often improved if one barrel of a double is opened up and the other left extra-full. The tightest choked .410 barrel that I ever found was on a Savage 42 that was made in the 1930s when it and the 3-inch .410 were introduced. Youngsters can start out with the 2 1/2-inch .410 in the Savage. I don’t like single-barreled .410s for kids because all that I have ever handled kicked hard with the 3-inch shell. By the time kids have grown enough to handle a pump gun, it is better to get them a 20-gauge gun, rather than a .410. I have killed truckloads of small game with the .410, one wild turkey shot on the wing at 15-yards and have never been without one. A South Carolina friend turkey hunts with his. He delights in calling the birds to within 20 yards, which is well within the gun’s effective range. I also enjoyed using .410 doubles in Alaska on spruce grouse and snowshoe hares. The big rabbits broke out of the snow at very close range, and you had to be on them in a hurry or not shoot at all. The same applies for Southeastern rabbits hunted in planted pines where I would quit after I got five. I did not want to carry any more rabbits around in the game pouch of my shooting vest. In short, the .410 bore is nice to have around if you have close-range work for it.